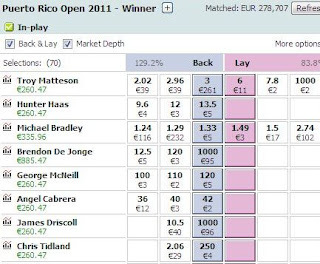 Trading the golf on Betfair is where I've made a lot of my profits over the last few years. For the best chance of being profitable in the longrun from golf betting, learning to trade is important as is taking advantage of huge outright prices in golf tourneys exchanges like Betfair offer. There are many low risk opportunities to exploit in golf trading and if you scroll down, you can see screen shots of some golf tournaments I've traded. What Is Golf Trading? 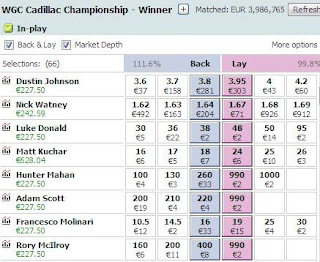 The most common form of golf trading is simply backing a golfer at a certain price and then backing against him (laying) at a different stage and price in the tournament to guarantee a profit or free bet. Example (this golf trade was posted on site): Dustin Johnson, trading at 25.0 is out early in the morning on day one at Pebble beach and I fancy him to go low on a course he loves. I know if he does that he will be trading in single figures. Say I place £50 on him at 25.0 (24/1), I stand to make £1200 profit if he wins the event. As predicted, he gets off to a fantastic start and comes all the way into odds of 5.0 (4/1) by the end of day one play. I now lay (bet against) him for my original stake of £50. This means I have a liability of £200 (£50x4) if he wins, which would come out of the £1200 I already stand to win if he lifts the trophy - so essentially, I stand to make a £1000 total profit, but I have now covered my stake and lose nothing if he fails. I now have some options: I can let this run, I can hope to trade later in the event or I can "green up" (equalise, or trade completely to ensure profit) now. 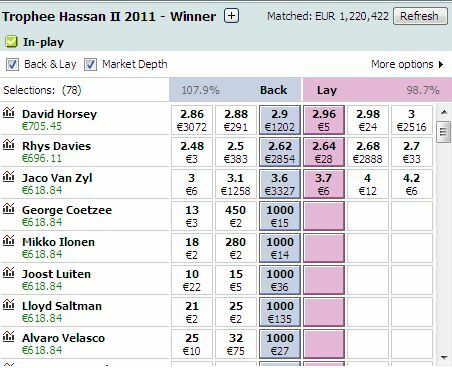 If trading fully is the preferred option, I simply divide the £1000 by his current odds (5.0) which gives me £200. 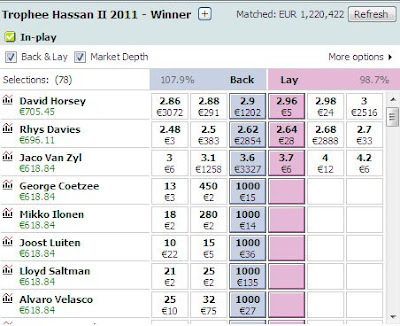 I then lay him for £200 and now I stand to make £200 profit from golf trading on the event no matter who wins or what happens. To get started with golf trading, simply create a Betfair account here and claim your free £20 bet to try it out. Follow my picks each week and have a go at trading them if they are running well. 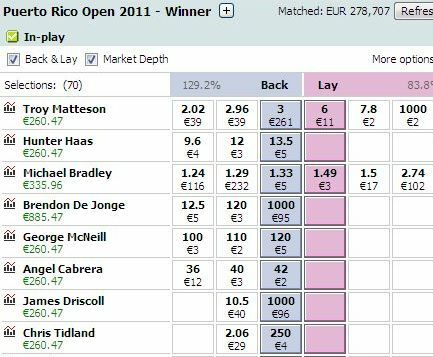 BETFAIR GOLF TRADING EXAMPLES: Below are profits I've made from certain tournaments from investments no greater than €200 (on the tournament as a whole) so that will give you an idea of how lucrative golf trading can be. Please note that these are screenshots from certain winning weeks - trading can be volatile and many losing weeks will occur if you're backing to lay but if you follow my picks you should be be profitable in the longrun from trading the golf. Hi I dont understand you theory - do you bet on a player to win, then bet against him to loose and which way the result is turning out means you exercise that position eg if he is loosing then dump your win bet ? You back the players to win and if they are going well their odds will reduce significantly. This will give you the opportunity to then back against your player(Lay) for a % of the initial potential profit, thus guaranteeing profit whatever happens to the player. 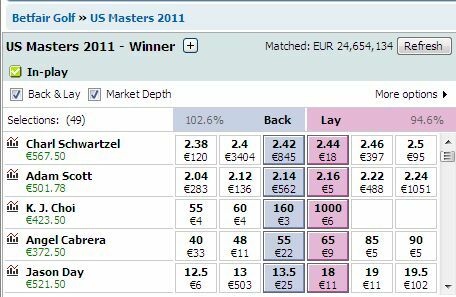 For example: Rory McIlroy was about 40/1 on the exchanges pre Masters. After 3 rounds he was trading at 1.8 (we will say evens or 2.0) to make it simple. If you placed a bet on McIlroy pre tournament, say £10, you would have stood to make approx £400 profit if he won. But if you then backed against(layed) him after 3 rounds at 2.0 for £200 of this potential profit, you would have stood to make approximately £200 whether he won or lost. I advise laying after the 3rd round at the earliest. A decent guide is to divide the player's pre tournament odds by 10 and only look to trade out if he goes lower than those odds. This will rarely happen before the end of round 3. Around mid way through round 4, I generally take the odds available (if they are in that range). Remember that you won't be trading out on most of your picks at all, you only need 1 to do very well to be profitable on the event overall. Quick question for you, as im only just getting into the betfair backing and laying. You say to lay at the end of round 3. I had 20 win on Noren for this weeks euro golf in malaysia at 90/1. After round 1, he is 2 shots clear at -8, and is trading at 8.5. Do you recommend laying him today after round 1? I also have Noren backed (75) and I won't even be contemplating trading him in until after round 3 even though I know he often starts fast and then either has a poor round Friday or Saturday. You said yourself you have 3 others backed so it just wouldn't be very profitable in the longrun to trade out now for a couple of hundred. If he even has a mediocre round 2 he will be trading at the same price or lower and if he's in the top 3 or 4 and near the lead after 3 rounds, the same so there's no point trading now and taking away your chance that he will beome a runaway leader and trade as low as 1.4 after 3 rounds. Even if he has a mare tomorrow, that will sometimes happen so don't feel as if you let it get away, it's all about the long term. But if you want to play it a bit safe, you could always cover you liabilities now (IE: Lay him for just £80) That way you will be free rolling and still with the potential for a good pay day on him. Excellent screenshots! Keep it up! Could you say a bit more about how you deal with the situations where you look like your selected player is not going to yield a profit? Say you have backed Mickelson for 2 pts at 4/1 and he hits one in the water for a double and is out to 14/1. Would you just accept that as a loss in your staking plan or would you try and get out of that situation if his price comes back to near to your original trading price? Also, do you ever lay a player in the same way? For instance if a player is approaching a tough set of holes you could lay him at his current odds thinking that he could well drop one or two shots in the next few holes. Or is this too risky? Great article - anything similar on other sites? Hi Darren, if I were ever to back Mickelson at 4/1, I wouldn't be looking to trade on him at all until he reached approximately evens (2.0) or better on the exchanges. If it got into the stretch on the final day, I'd take 3.0 or better. Most of your picks you will not be traded out at all. Regarding different holes, that's more of a 'gamble' that I try to avoid as things can and do go badly wrong really quickly on any hole (Just ask McIlroy) but when I'm looking to trade out in round 4 around the turn and my guy is out ahead of the leaders, I do try and wait until after he plays a par 5 etc as a birdie will make a big difference to the odds and it's unlikely he'll bogey, par will stay the same. Small stuff like that. Another example was with Bubba Watson last year. I got into a situation where he stupidly went into the water and his odds tumbled but he managed to scrape into a playoff with Verplank and Pavin. Now his odds were obviously hovering around the 3.0 mark but instead of trading I decided to wait until he hit his approach to the green as the 18th was a par 4 really suited to big hitters and he was against 2 short hitters(Pavin the shortest on tour). This played out extremely well as Pavin got into trouble and Bubba bombed 1 down and nailed his 2nd and his odds hit 1.4 or something like that. Other sites are about. Try Laytheodds.com or look around searching for keyword term "successful golf trading". Most sites will make you pay for trading strategies though. Do you find it better to Dutch the picks, even when intending to trade out later in the competition, or simply spread your stake evenly across your chosen players? The reason for this is that the price would be a lot different for say a 30/1 player and 100/1 player(pre tourney) that were tied coming down the stretch. The longer odds guy would be still a big underdog and at a significantly bigger trading price. In general, I stake according to the value I see in the player. Hi, it all depends on the value I see in the player. IE: The odds together with his chances. Generally I bet 0.5 - 2 units on each player. Obviously the 2 unit bets would be on the shorter prices (bigger favs). If you don't stake in units, (as a guide)get the midpoint of your usual bet size and use that as a 3 unit bet. EG. if you stake $50 on an average bet, for you, $30 would be a 3 unit bet, $10 a 1 unit bet, $50 a 5 unit bet and so on..
Just a quick question. if i backed mcilroy for example and put down €10 at odds of 40/1 pre tournament. and if after the first round he was 20/1. my lay stake would be €20 to guarantee a profit of €9.50 regardless of who wins. i know these are micro stakes but my question is would i need €400 in my a/c to lay €20 at 20/1 or would it just balance out.? I came across that scenario a couple of times in my earlier days and from what I remember I'm almost certain it's fine once the potential profit on the market covers the liability. Just discovered your site and it looks very helpful. I'm a recent beginner on betfair and backed 3 players in the John Deere Classic for micro stakes (£2). One of those was Paul Goydos at 100 (99/1) and after the 1st round he was into 60 (59/1). In your McIlroy example earlier you mentioned laying "for a % of the initial potential profit". Can you please expand on this in terms of my Goydos bet? For example, If you backed him for £2 @ 99/1, your potential profit is £198 on Mcilroy. You could now lay Goydos for £2 @ 59/1 with a £118 liability which would essentially give you a free bet on McIlroy, to win £80 (£198 - £118). You could then lay him again for £1.33 (80/60) to guarantee you a profit of £1.33 on McIlroy whatever happens. Like I said, it's much better to wait in the longrun. Sorry Nic, you lost me. Maybe I confused things by mentioning McIlroy - he has nothing to do with my current bet. I guess I'm trying to ask how best to profit when I've backed Goydos at 99/1 and he is now 59/1? Thanks for the prompt reply too. Interesting posts. I understand trading but am interested to know what % of your bank constitutes 1 point ? For example if I have a €100 bank does that mean 1 point is €1. Other question, you vary your stake size depending on selection odds. Are you backing using liability for example by using a constant liability stake of €200 if a player is 200/1 the stake is €1, if he is 100/1 the stake is €2, if 50/1 then €4. I agree with your green up point but surely there are exceptions such as McIlroy was Odds on before the last round of the US open? All these odds and stake calculations are automatic if you use the Geeks Toy (Free) so maybe your readers would benefit from it. Just in the above example, if he was to lay €2 @ 60, he'd make €80 if Goydos was to win and get his original €2 stake back, so break even, if Goydos was to lose. Correct? If you divide that €80 by 60, you get 1.33. So if he were to lay €3.33 @ 60, if Goydos won would he just break even then and if he lost he'd make €1.33? If I'm correct this far, it's obviously not worth guaranteeing the €1.33 in the event of a loss and not profiting in the event of a win, correct? Could you, in this instance, lay €2.50 @ 60, which would guarantee you €0.50 if Goydos were to lose and €50 were he to win. In the section about "green-booking", it seemed to be suggested that you wouldn't leave anything riding on Goydos winning. Obviously this example is ridiculous as the change in odds is so small but the principle remains. Let's take another scenario for The Open this week. 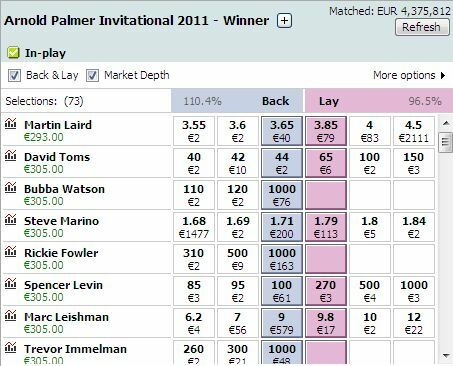 Ryan Palmer is at 310 on Betfair. I stake €2.00 at 310. He has a good first and second round and comes in to 31. At this point I stand to win €620 if he wins the tournament but lose my €2.00 stake if he doesn't win. If I then lay €2 at 31, I'll make my original stake back if he loses and I'll still make (€620 - €62) €558 if he wins. If I am to greenbook, I would divide 558 by 31 (18) and then lay that, along with the €2.00 stake. So I then lay €20.00 at 31. In the event that Palmer goes on to win The Open, I break even. In the event he loses, I gain €18. What would you do in this situation? Would you only lay a percentage of your potential profit or would you do as I have outlined above? Great site by the way. Thanks a lot. Hi mate, you obviously have a good understanding of how it all works but my system is a strategy that looks over the whole year rather than an individual tournament, therefore I'll let a lot of winning positions push on (referring to the Palmer example). IE: Even though you could make a healthy relative profit, that wouldn't be enough in the long run to profit so much when you take into account the other liabilities I'd have in the tournament(remember I back 6 or 7 players). In other words, in this instance, you'd be trading a potential winning position too early. It's all to do with your own strategy. If Palmer was say 1 of 2 larger bets I made in the tournament and I didn't have liabilities on 5 other players to cover, then it would be profitable longterm to trade now but then again it would all be relative to how I thought he was going to perform the next day. I'd probably in this instance just lay Palmer for my liability on him and then wait for him to hopefully trade much lower and then green up. To give you another example, Johnny Vegas who I tipped last week at 130 was trading as low as 11.0 in round 1 and around 15.0 after 2 rounds. I let it ride and didn't get anything out of him in the end as he had a disastrous 3rd round. If I had greened up on him at those prices, I'd have made a nice profit (on him but only marginal on the tournament) but nowhere near as much as I'd make in the longrun if I waited for round 3 to play. If it played out say 10 times, if he went on to shoot low only twice or 3 times in the 3rd round, the profits would be a lot larger than if I took the 15.0 every time over the course of 10 tournaments. Again some people would like to sacrifice extra profits for less bankroll volatility, it's all down to personal preference and trading style. 1pt or unit equates to whatever you want it to be. Some people stake much larger than others. For me my max bet (5units) equates to 2% of my bankroll. Staking: I back each player to return approximately the same amount if a trading position is hit. I factor in projected odds as I know where odds are likely to move to in every scenario. I use sort of a dutching principle. There are exceptions as always. MCIlroy: Yes sometimes I'll trade after 2 rounds but not often. 2 Rounds would be the very earliest. EG. David Toms' win earlier in the year at Colonial. I tipped him on here and equalised after 2 rounds when he traded at 1.46. Incidentally he went out as far as 3.3 (maybe more) before coming back to win. Reallylike this method and would of greened up over £700 on the irish open and green berrier with a £500 bank on each. my only major concer is what if all your 5-7 picks flop or a player storm to a 9 shot lead going into final day? complete wipe out!!! any advice on that one nic? That can and will happen. It's a volatile strategy. If you stick to my picks, it's rare that you won't get at least something back (across the 2 tournaments) but long losing runs will happen. Bankroll management is the key here. If you're staking £500 a tournament, you need a bankroll of at least 10k, preferably more or you'll go bust. hi nic, never laid a bet before, just wondering when you want to lay say to make the money youve put on to back them, do you have to have the amount you are liable for in your account? e.g, had a £10 bet at start, odds into 4.0, do you have to have £40 in account? Enjoy your thoughts and advice pre tournament via twitter, however I generally bet outright, but keen to learn more re lay betting. Ive read the comments above, which are all interesting, however I cant work out what happens if a player places. Take this weeks Valero for example. Jacobson is 20/1 on Betfair. I would normally back him say £10 ew and hope for the best. However with lay betting, are you saying I back him in this manner but when his prices shortens bet on him to essentially lose. What happens then if he doesn't win but only secures a place? Apologies if there is really obvious answer to this. Placing has no bearing trading this way. If you bet here in betfair its win only - nothing for a place. so if your golfer places you will win the lay amount ie he did not win. One option you could do if you wanted is place an e/w bet on one bookie and then lay the win amount in BF when the odds come down, but then you will need the funds in BF to do so. Then if your pick places you would win the lay amount AND the place win ! But the odds wouldn't be as good on the normal bookie sites .. When you decide to lay - is there always enough liquidity on Betfair for you to be able to do that? Really like your website, just trying to grasp the concept on backing and laying as I have only been a backer to date but I certainly intend to join Betfair after reading your website. The other day just prior to the Canadian Open I saw the odds of the winner at 30/1 on Betfair and thought that they looked good. After that his odds came way down to Lay at around 3/1 I think. If you Backed him at 30/1 for 10dollars and then Layed him for say 20.00 would that work I am not sure but not a big punter so just seeing if little fish are sweet would work on this system. Also if when you Backed and then Layed is it a done deal or what happens?